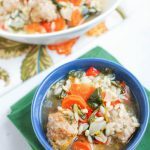 Packed with veggies and mini meatballs, this soup is sure to warm you up on even the coldest day! In a large dutch oven, saute carrots, onions, peppers and garlic over medium heat for 5-10 minutes. Meanwhile, make the meatballs by combining pork, breadcrumbs, egg, parsley and pepper in a small bowl and mixing well with your hands. Form into small meatballs and set aside. Add broth and water to dutch oven and bring to a boil. Meanwhile, In a skillet, brown meatballs on all sides over high heat. Add meatballs and orzo to boiling pot, cover and reduce heat to simmer for 15 minutes.